The new impeller for the Movitec type series substantially improves the pumps’ NPSH value. © KSB SE & Co. KGaA, Frankenthal. The KSB Group has developed a special impeller for its Movitec multistage high-pressure pumps, which improves the pumps’ suction characteristics (NPSH value). It is designed for applications with critical inlet conditions (e.g. boiler feed applications) as well as applications in which the pump is required to take in water from low-lying tanks or at higher temperatures. Under these conditions, a pressure drop in the intake area may cause cavitation to occur in the first pump stage. This can result in excessive wear of pump parts or motor bearings as well as a reduced service life of the pump due to damaged parts and an unbalanced hydraulic system. 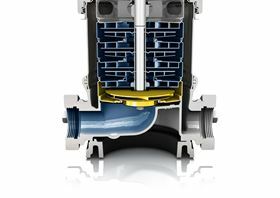 KSB’s design engineers developed the new impeller so that it can be used with a number of Movitec variants without the need to modify the outer pump casing. The impeller features a modified inlet diameter, vanes allowing a slightly diagonal through-flow and a newly-designed stage casing, which all improve the pump’s NPSH curve. The multistage centrifugal pumps from the Movitec range are designed for handling fluids such as water, coolants, condensate and mineral oils in applications such as industrial boiler feed installations in steam circuits, recirculation and fire-fighting systems and cooling water circuits. KSB FlowManager can be used to operate and configure pumps.